Kobe Bryant has reached a milestone. 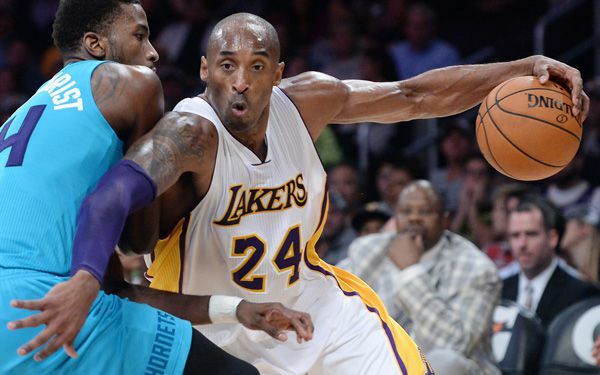 The Los Angeles Lakers basketball star passed Michael Jordan for third on the NBA's career scoring list Sunday night. It happened in a 100-94 Laker victory against the Minnesota Timberwolves. Bryant entered the game needing nine points to pass Jordan. He is the player with whom Kobe is often compared. He got the mark with two free throws with 5:24 left to play in the second quarter. "I'm just honored to be here, man, to still be playing," Bryant said. "I appreciate being able to play this long. Careers normally don't last this long." "I congratulate Kobe on reaching this milestone," Jordan, who is now the owner of the Charlotte Hornets, said in a statement. "I look forward to seeing what he accomplishes next." The two players have been linked for years. The Timberwolves stopped the game. The crowd gave Bryant a standing ovation as Wolves owner Glen Taylor presented him with the game ball. Bryant received hugs from teammates and the Timberwolves. He waved to the crowd. Bryant has been chasing Jordan for almost two decades now. He's still one league championship short of the six Jordan won with the Bulls. Bryant had 32,284 points when he took the floor against the Timberwolves. He missed four of his first five field goals. Then he knocked down a 3-pointer to pull within two points. He nearly passed Jordan with one of his patented fall-away jumpers from the baseline. But it rimmed out. Then, with 5:24 to play No. 24 stepped to the line. He swished two free throws to do it. He finished the night with 26 points and 32,310 for his career. Who is the greatest player ever? "I think it puts him in the conversation of who is the greatest," Lakers coach Byron Scott said of Kobe. I'm really proud of Kobe Brayant. That he Scored more hoops then Michel Jordan. But I still think that Michel Jordan is better then Kobe Brayant. 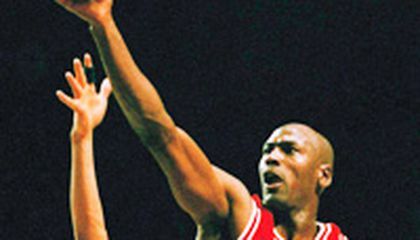 If Michel Jordan stilled played NBA he still would of beat Kobe Brayant. Wow Kobe beats Michael Jordan record In career scoring, but I still think Michael Jordan is still is better. I think if Kobe works hard he could catch up to Malone.But it is gonna be a challenge for Kobe to catch up to Abdul. How many points did the black mamba score? * He is my favorite player. * How did they mete? they are two competitors players and all time grates. Kobe Bryant can still score points and Micheal Jordan can not because Micheal Jordan is retired and Kobe Bryant is not so, Kobe Bryant can still play games and score more points. Kobe Bryant has beaten Michael Jordan at the top scoring hoopsters. This is because he has been playing in the NBA for 18 years and is extremely good at making lots of lay-ups. I think Jordan is a better player than Bryant because he earned more MVP awards and more championship rings than Bryant in 13 years of his NBA career. Also, Jordan reached the top scoring hoopsters in 230 fewer games than Bryant. Kobe Bryant is a good player, too. Id like to see another talented player try to beat the top of the list. I think Kobe can pass Karl Malone because he has 4,500 more points to go and he can pass him in another 4-5 years. Im doubtful that Bryant can beat Kareem Abdul-Jabbar because he has a healthy margin of 6,000 points and more over Kobe Bryant might not play for another decade because he is already 36 years old. Kobe Bryant can still move higher on the career scoring list ,but Micheal Jordan cannot because Michael Jordan don't play anymore .